"This book is absolutely one of the most important documents ever made available to the accordion world! It is extremely well written, clear, concise, documented and above all, for most of us, it is so interesting that we really want to read every page." 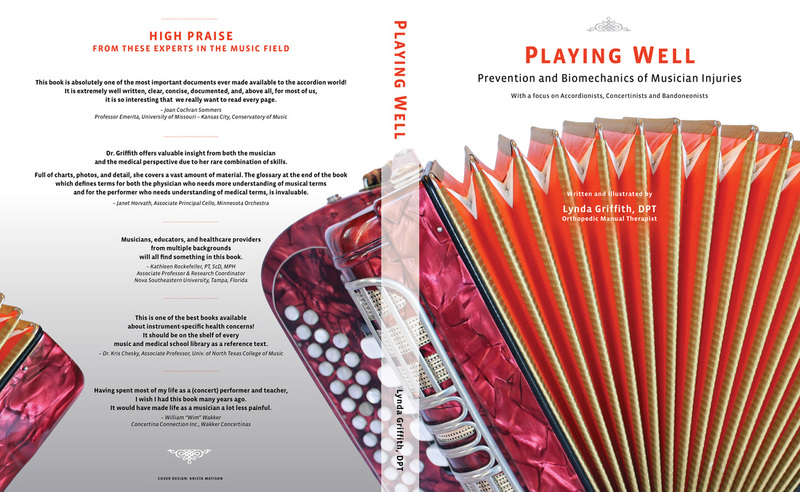 PLAYING WELL is written and illustrated by Lynda Griffith, Doctor of Physical Therapy, specialist in biomechanics of orthopedic injury to musicians, dancers and athletes, player of accordion, concertina and bandoneon, and certified repair technician for accordion family instruments. PLAYING WELL is a detailed reference for instrumental musicians, players, parents and teachers with regard to injury, injury prevention and performance. Also appropriate for physicians, physical therapists, occupational therapists, massage therapists, chiropractors and other practitioners who treat injured musicians and would have academic or professional interest in knowing about instrumental musician injuries. PLAYING WELL will give player, teacher, parent and practitioner common ground to facilitate communication and understanding. 350 pages, in English. 75 color illustrations, 157 black & white illustrations, 31 tables, 35 clinical notes, 350 references, index. ISBN 978-0-615-51970-8. LCCN 2012910685. 3. International Player Survey; 4. Give Yourself a Hand; 5. Tensegrity & the Human Body; 6. Manual Therapy, A Tensegrity Perspective; 7. Back Story; 8. Head, Neck & Shoulders; 9. Elbow, Wrist & Hand; 10. Contributing Factors & Special Considerations; 11. Chair Selection; 12. Self-Help Now! Appendices and glossaries include: Appendix 1 Accordion Family Instrument Study Questionnaires; Appendix 2 Bellows-Driven Free Reed Instruments; Appendix 3 Hypermobility Screening. Accordion-Concertina-Bandoneon-Music Glossary; Medical Terminology Glossary. Click on Buy Now button below to use your credit card or PayPal account at PayPal (account not necessary for purchase).